Hatch Realty and the Erik Hatch Team are passionate about real estate. They are the fastest growing real estate company in the Fargo Moorhead area and recently moved into a new office to accommodate there passionate growing real estate team. Marketing is extremely important when it comes to real estate and so the Hatch Realty Team partnered with Google Street View | Trusted to create a high definition 360 Virtual Tour of there new office at 1205 16th ave Fargo, ND. “Giving potential clients a chance to virtually visit our office before coming in guarantees us more visits.” -Erik Hatch, Owner, Hatch Realty. The entire Hatch Realty team has been involved with “Homeless and Hungry” for the past 8 years and they believe strongly in giving back to the community. The Forum named Erik Hatch “Best Real Estate Agent 2013”. If you are looking to looking to buy or sell a home you owe it to yourself to visit with the incredible team at Hatch Realty. The Erik Hatch Team of Hatch Realty is in the business of helping people. We just happen to sell real estate! 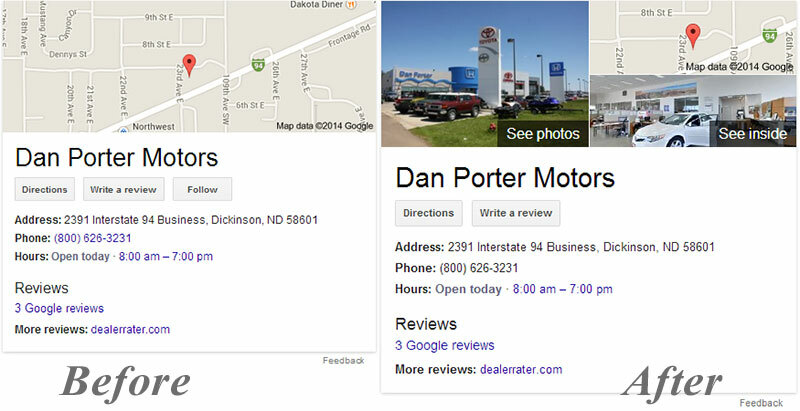 Dan Porter Motors in Dickinson, ND sells new and used vehicles. Their new car offering includes Honda, Toyota, and Scion. Recently they moved from a 64-year old building into a newly built, modern dealership. It has features you expect in a modern dealership, like clean and bright showroom, parts and service. Also maybe some features you don’t expect, like a drive-in customer delivery bay they take great pride in. It allows them to walk-around and explain the features of a vehicle in a private, climate controlled area. Rain or shine, hot or cold, you’ll always enjoy those first moments with your new vehicle in comfort. Dickinson’s proximity to ND’s oil boom means it’s a city with a lot of new people, new businesses, and new buildings. Google Maps Google Street View | Trusted 360 helps Dan Porter showcase once if the nicest of all the new buildings. 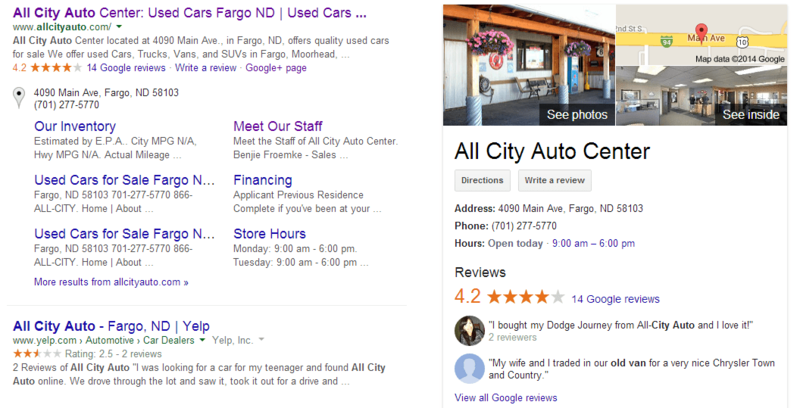 All City Auto is a used car dealer at 4090 Main Ave in Fargo, ND with a large inventory of vehicles to meet any budget. They have a bright and welcoming sales office they were eager to showcase. Grab a flavored coffee, tea or hot chocolate from their single cup coffee maker, or relax in leather seating. Children are welcomed too, with a sweet treat or activity. The staff at All City Auto is tech savvy, and were the first in line to request a Google Maps Street View | Trusted 360 photo shoot. They take pride in the appearance of their business, and their web presence. Now it shows in their Google Search results, and in the ranking of important key words. Up until now, when a client asked if Google Business Photos had any influence on their search rankings, I just kind of mumbled something to the effect of, “Usually when Google rolls out a new service, the companies that adopt the new technology do better in search rankings. And it can’t hurt, so yes, let’s try it out.” But do Google Business Photos help with local search rankings? Google’s been mum, and I haven’t been able to find any research on the matter. So I decided to test if there was a correlation between adoption of Google Business Photos and local search rankings. We found that (for the most part), sites that ranked the highest in local search had also adopted Google Business Photos. Google’s Street View panoramic images of streets are moving indoors. The search engine is now posting panoramic views of the interiors of businesses. You probably remember when Google sent vans to drive through every street around town, taking pictures of the outside of businesses and homes. Now you’ll be able to see inside some businesses with the same panoramic technology. A new feature inside Google Maps lets users peek inside businesses before visiting them, thanks to panoramic photos shared by the businesses with Google.